In analysing Japan’s updated space policy , Andrew Davies and Rod Lyon suggest the prospect of Australia joining Japan in greater cooperation on the high frontier. Noting that the broader defence and security relationship with Japan is deepening, they argue that there are opportunities for cooperation in areas such as remote sensing and surveillance. Their post highlights the fact that although Australia could embark on a costly ‘end-to-end’ space capability, complete with rockets and launch facilities, there’s little need to do so, as much of the ‘hardware’ is already available elsewhere. Australia is undertaking significant research and development into low-cost small satellite technologies such as ‘CubeSats ’ that are several orders of magnitude cheaper than large satellite systems such as the multi-billion dollar US Wideband Global Satellite  system. 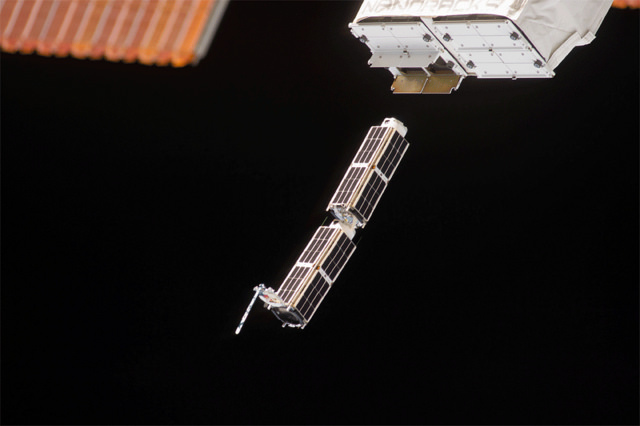 Although small satellites and CubeSats do trade capability for low-cost, they have utility for role-specific applications in terms of tactical communications and intelligence, surveillance and reconnaissance support. This particularly applies in instances where ‘just enough and just in time’ might be more useful for Australia and its coalition partners than a vulnerable  high-end satellite that can only be provided by the US. At as little as US$50,000, the relative low cost of such satellites in comparison with traditional larger ones makes a ‘mass production’ approach possible. When taken together with the potential transformative effects of re-usable rockets (here  and here ) that could dramatically reduce the cost of delivering payload to orbit, the right approach is for Australia to leapfrog time and reduce cost by exploiting cheaper but still effective commercial off the shelf space capabilities and cooperate with allies that already have an established space programme. So if the hardware’s available, what’s needed is ‘software’ in the form of policy innovation. The opportunity for Australian–Japanese space cooperation suggested by Davies and Lyon might ultimately lead the way towards a regional space security community that brings in other potential members, such as India, Singapore, South Korea and Indonesia, and of course with an over-arching role for the US. Those states either have existing space programs, or will seek to exploit space capabilities for their national security in the future, and share common security interests with Australia and Japan. The challenge will be avoiding ‘lowest common denominator’ outcomes that often characterise multilateral security arrangements, particularly those that are based on consensus where ‘everyone agrees or no one agrees’ outcomes are the preferred solutions. In this sense, a staged process, proceeding from Australia–Japan, to perhaps a trilateral arrangement with India, which already has an active space program, and then incorporating others over time could help evolve this concept. Pro-active Track 2 and Track 1.5 diplomacy can prepare the soil. By sharing expertise, research and developmental costs, and even launch facilities based on ideal geographic locations—launching re-usable rockets along the equator delivers significant benefit  to a would-be space power in terms of lower cost per kg of payload to orbit—Indo–Pacific Asian states could more rapidly exploit space as an operational domain, for both civilian and military purposes, with the latter being particularly relevant given an uncertain strategic outlook now on the horizon. Promoting the role of the commercial space sector in order to reduce cost and timelines is also important for development of such a concept. One technical challenge which must be resolved is how small satellites might be networked so that a constellation of them gives similar operational capability to a single larger and more expensive high-end satellite. Remembering that Moore’s Law implies that integrated circuit technology is becoming more powerful even as it shrinks in physical size, the possibility of a multi-national constellation of small satellites, sharing information and relaying it to coalition forces operating at sea, in the air and on land suggests a ‘swarming approach ’ in military space operations. That may mitigate risk from adversary anti-satellite threats in tactical terms—attacking a diffuse ‘sensor cloud’ made up of many networked CubeSats is more difficult than targeting a single large platform. It also provides a strategic benefit in that an attack on one satellite in a multi-national swarm might be constituted as an attack on all, dissuading an opponent from such an attack by raising the prospect of horizontal escalation. Taking this next policy multilateral step towards a regional space community is important given that space is now the centre of gravity of modern information-led warfare. Without the use of, or access to, space, the ability to sustain such military operations becomes impossible. Australia, like other states in the Indo-Pacific region, needs to prepare for a future conflict environment in which space is contested from the outset of hostilities, and maybe even preceding such hostilities. The opportunity to build resilience into emerging military space capabilities, through closer cooperation and through leveraging innovation and the new technologies noted above, is a policy option that should be rigorously explored. In that regard, an Australia–Japan effort to lead efforts towards a regional space security community is timely. Malcolm Davis is a senior analyst at ASPI. Image courtesy of Flickr user Stuart Rankin.